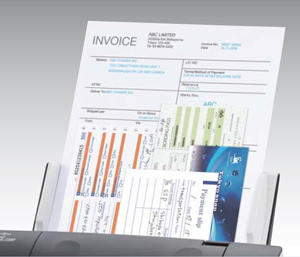 The new scanners allow the user to scan a wide variety of paper thicknesses (27 to 413 g/㎡), as well as plastic cards with the same feeding mechanism inherited from our high-end models. In addition, Paper Protection constantly checks along the whole document length during scanning and automatically stops paper feeding when error occurs to avoid any damage to the document. All in all these deliver the reliable scanning experience expected from Fujitsu. 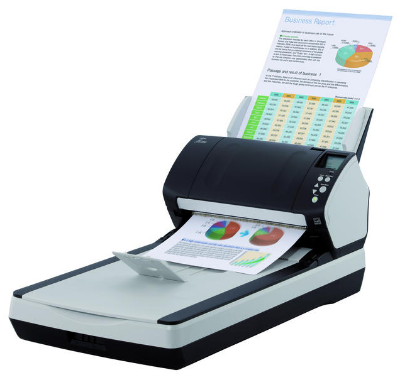 The fi-7240 automatically detect the document size when scanning a mixed size batch. Furthermore, it is equipped with Skew Reducer to detect the alignment of scanned documents and correct paper skews to minimize missing the edge of the scanned image. Users can rest assured that the result will be good even when scanning documents that are not aligned correctly. The fi-7240 scans at a speed of 40 ppm (A4, color, 200/300 dpi). Simply press the scan button and it will start scanning within a second. Scanning with the fi-7240 will not keep you, or your customers, waiting. 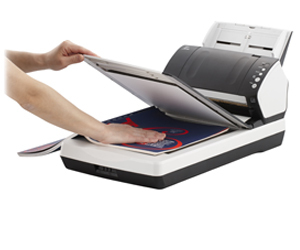 The fi-7240 has a built-in flatbed (glass surface) that is able to scan thin documents or thick books which are impossible to scan using an ADF scanner. The PaperSteam IP scanner driver, which supports TWAIN/ISIS, saves the inconvenience of fine adjusting the settings for the OCR process. It automatically converts the images into exceptionally clean images, accelerating OCR even when scanning wrinkled or soiled documents or documents with a background pattern.